For the first time in their history, Palestine are playing with house money, assured of a spot in the finals in 13 months time. Their opponent, Maldives, are showing up with nothing to play for after enduring their third loss of the campaign at the hands of Oman last month. Palestine's last qualifying campaigns were much more dramatic. Their only other successful qualification was a tense affair secured through the byzantine and convoluted Challenge Cup path. The 1-0 win over Philippines was tense and punctuated with wasted chances and penalty claims being waived away before Ashraf Nu'man curled a fantastic free kick with 30 minutes left to play. Palestine's last two dead rubber qualifying matches came in 2012 and 2004. After being eliminated at the hands of Korea DPR in the 2012 Challenge Cup semifinal, a disinterested Palestine succumbed to Philippines in the third place playoff in a 4-3 shootout. 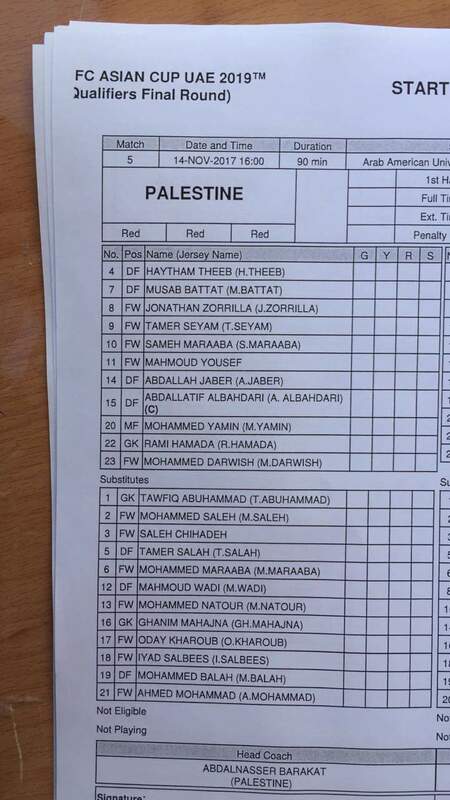 Palestine's manager at the time, opted to play a mostly unchanged side. That was not the case in 2004 when a slew of players made their debut. 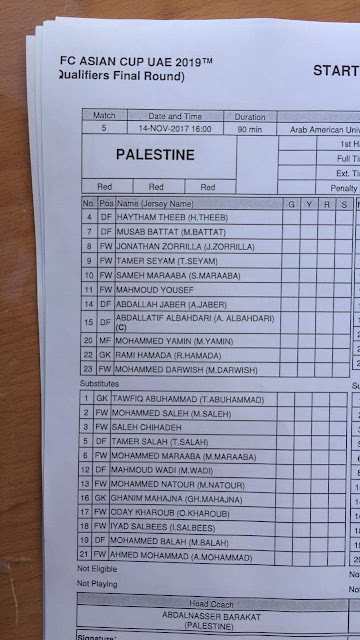 Palestine's attempt to qualify for the 2006 World Cup started brightly with an 8-0 thrashing of Chinese Taipei and a 1-1 draw with Iraq but a pair of 3-0 losses at the hands of Uzbekistan derailed any hope of qualification and several changes were made to Palestine usual starting line up in the final qualifier. In goal, Abdallah Al-Sidawi collected the first of his 13 caps. Imad Zatara was the other debutant and became the fifth Palestine player to score on his debut for the national team. Both players would use the opportunity as a springboard for the national team careers. Come Tuesday, quite a few lesser used players could find themselves being relied upon. Abdel Nasser Barakat handed Mohammed Abu Khamis and Ghanem Mahajneh their first starts last month and also brought on Mohammed Natour, who scored on his debut; the 12th national team player to accomplish that feat. With various absences expected (see below) this could be the game that yields the debut of 18 year old Oday Dabagh and 20 year old Mohammed Yousef. It might not seem so but this qualifying campaign has been something of a success for Maldives. The islanders, who participated in stand alone Asian Cup qualification for the 1996, 2000, 2004, and 2011 editions, never registered a single win. They have two to their name now thanks to wins over Laos and Bhutan. Darren Stewart's men were always going to be up against it given the superiority of Oman and Palestine but both sides were given something of a scare en route to 3-1 and 3-0 wins, respectively. Exposure to this level of football will only help and with Afghanistan joining the newly created Central Asian Football Federation, Maldives have a good chance of contesting the final of the SAFF Championship against perennial champions India. For the second match day running, Abdel Nasser Barakat will not be able to avail of all the players he has called up. Most notably, Mahmoud Wadi, who is leading the Jordanian Premier League with eight goals in eight games has not been allowed to enter Palestine by Israel's occupation forces. The same fate also befell his club teammate, Mohammed Balah. Several players will also be with their clubs having asked to prioritize important domestic league fixtures in the wake of Palestine's qualification. That list includes Police Tero's Jaka Ihbeisheh who would have missed two matched had he accepted the call up. Pablo Tamburrini and Alexis Norambuena are due to face each other on November 12th, when San Antonio Unido and Deportes Melipilla meet in the Chilean Segunda. With both teams in action less than 24 hours after the culmination of Palestine's qualifier, insisting either player attend would create serious friction with their clubs. Hosam Aiesh is only just coming back from groin problems. Ten minutes of Europa League action is the only game time he has seen since the last week of October. Mahmoud Eid's injuries left him sidelined for more than half the season and at this point we are unlikely to see him play- for club or country- until 2018. 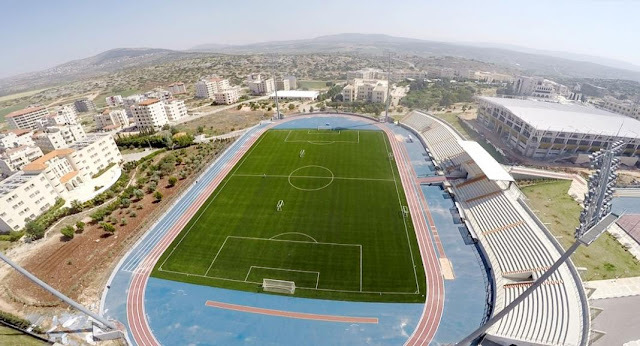 For the first time, the senior team will grace the pitch of the Arab American University in Jenin. The small stadium has only one modest stand and can only seat 5,000 spectators. The switch in venue is an attempt on the part of the PFA to get the national team to visit as many parts of the country as possible. It also comes during a time when the Faisal Al-Husseini Stadium is undergoing renovations. The ground previously hosted a qualification group for the 2016 AFC U16 Championship. Jenin was slated to host Palestine's final 2018 FIFA World Cup qualifier against Timor Leste but the match was shifted to Hebron in the wake of the Malaysia game being moved to Jordan. Should Jenin generate a sellout crowd it could become a viable venue for national team going forward.